The Battle of Tashkessen, fought in December 1877 during the Russo-Turkish War, is probably the most competent rearguard action of the nineteenth century. Some 3000 Ottoman troops stalled 25,000 Russian soldiers for four days, allowing the main Ottoman army to withdraw. It's an action that few people will have heard of today. All the more remarkable when the Ottoman force was commanded by a former British Colonel, Valentine Baker, or Lieutenant General Valentine Baker Pasha, as the Ottomans knew him. The Shipka Pass and siege of Plevna are reasonably well known, with at least 18 roads in Britain named after Plevna, but not one named after Tashkessen. Frank Jastrzembski, in a new book on the battle explains why. Colonel Valentine Baker was the subject of a notorious scandal in Victorian Britain. A well known and highly respected army officer, he was convicted of indecent assault on a 21 year old woman on a train in June 1875. He served a twelve month prison sentence, albeit in more comfort than most of his fellow prisoners, and was then cashiered from the army. Despite support from many in the military establishment, Queen Victoria refused all requests for reinstatement, until just before he died. Unable to serve in the British army, his friend the Prince of Wales helped him gain an appointment as a Mirliva (Major General) in the Ottoman gendarmerie. Baker was something of an expert on the east having travelled and written extensively about the region. Britain had supported the Ottoman Empire in its disputes with the Russians, most recently in the Crimean War. However, Ottoman atrocities in Bulgaria meant that public opinion in Britain had made overt support difficult. Baker reported to his friends at home on the events on 1876 and the outbreak of war with the Russians in 1877. After initial setbacks for the Ottomans, Baker joined the army of Mehmed Ali Pasha based at Shumla in the Quadrilateral fortresses on the Danube. Squabbling amongst the Ottoman commanders militated against a coordinated counterattack and despite some modest advances by Baker's division, it ground to a halt on the River Lom. 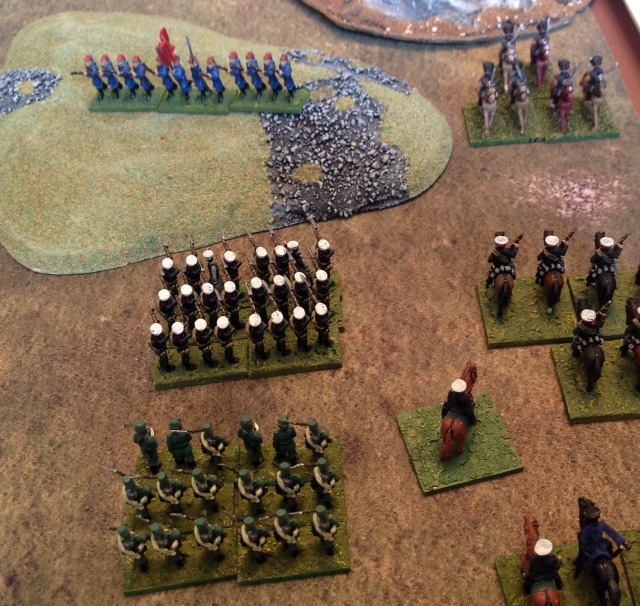 Baker got himself a new command in the Ottoman army based at Sofia, preparing to relieve Plevna. However, the army was simply not up to the task and after the fall of Plevna, on 10 December 1877, the released Russian and Romanian troops spread across Bulgaria. 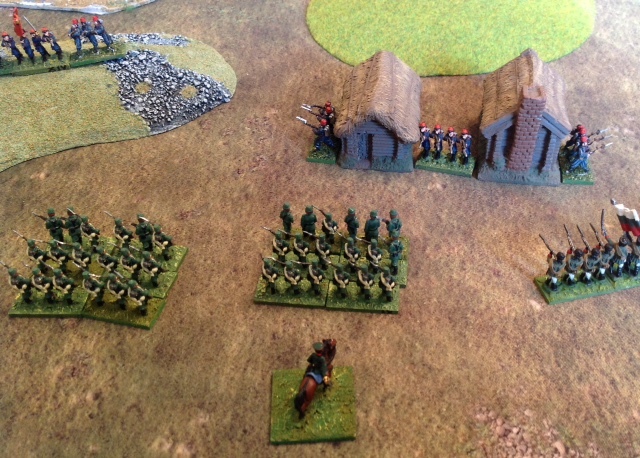 Baker spotted that the Ottoman defences on the Kamarli line were about to be outflanked by some 20,000 Russians, commanded by General Gourko. Baker took a small force of three battalions with some Arab cavalry and artillery to the Tashkessen Pass, in an attempt to buy time for the Ottoman army to withdraw. He received some reinforcements, but his force never exceeded 3,000 men, of varied quality. 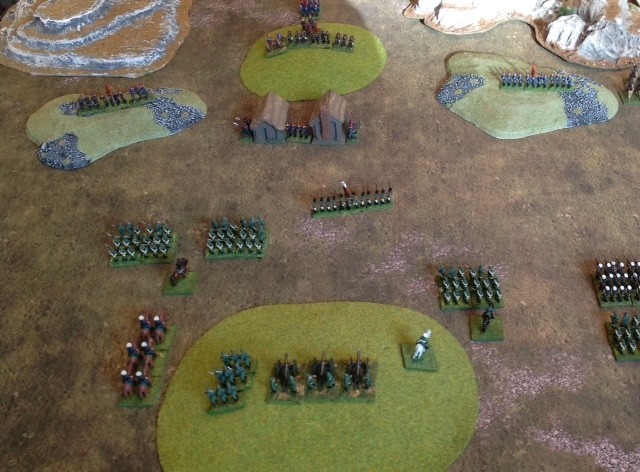 The battle was a textbook rearguard action, with the effective use of terrain, reserves and a withdrawal over several positions. Garnet Wolseley described it as, 'One of the most important events in the war' and Colonel Maurice in a lecture to British officers said it was, 'the most wonderful rearguard action our times, if not of all time'. It was without doubt, Bakers's finest hour. His career after the 1877 war took him back to Britain where he was partly received back into society, but not the army due to Queen Victoria's continued opposition. He was appointed to the Egyptian gendarmerie after the British occupation of that country in 1882. In December 1883, in the Mahdi uprising in the Sudan, his very weak force collapsed at El Teb. Baker barely escaped with his life and ended his career in Egypt, where he died on 17 November 1887. He never knew that Queen Victoria had acceded to his reappointment to the British army a month or so earlier. He was buried in the English cemetery of Cairo. I have to confess that I didn't make time to visit this battlefield during my visit to the main battlefields of the Russo-Turkish War. The modern motorway from Plovdiv takes the traveller south of the old Sofia road at Tashkessen, called Saranci today. Having read this book, it was a major oversight. When my copy of this book arrived, I was ploughing through another somewhat heavy going tome. After dipping into it, the pull was too strong and I read it over a weekend. 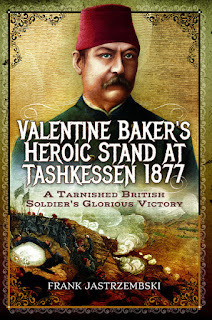 The author tells the story of Valentine Baker from his early career, through the scandal and onto the Russo-Turkish War. His involvement in the war and the Battle of Tashkessen is the focus of the book, but he carefully outlines the context and the strengths and weaknesses of the opposing army. He ends with an interesting chapter on comparable rearguard actions. If there is one small shortcoming in this book, it would have benefited from some diagrams of the battle. Baker's 19th century map is helpful, but inadequate by modern standards. This is brilliant book, well researched and written, throwing light on a subject that deserves more attention. 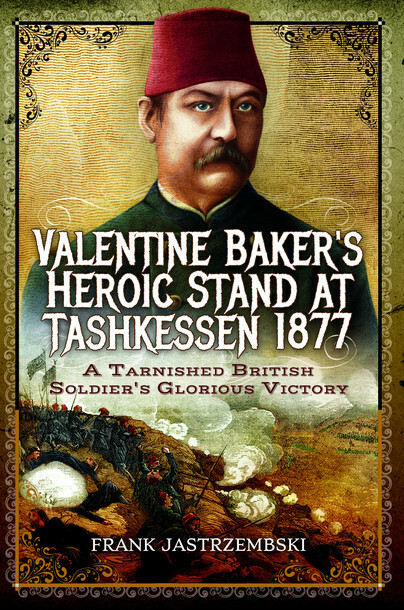 Not just the the fascinating story of Valentine Baker, but also the role of rearguard actions in warfare. Taskkessen is indeed a model to be studied. Highly recommended. So, onto the tabletop. I decided to dust down my 15mm armies for the war, not least because of the numbers of Russian's involved. I condensed the battle down to three stages. The initial probing assaults, followed by the attempt to outflank the position, and then the final assaults on the second line positions. I'm afraid my generalship didn't match the brilliance of Baker, but it did give me an insight into the challenges he faced. 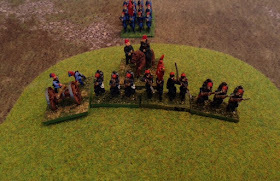 This is the right hook column, including guards units (white caps) commanded by Kourloff.